Employee wellness is certainly the topic of interest in human resources these days, but with corporate budgets tighter than ever, the idea of instituting a costly new program may seem unrealistic. Those who tout the advantages of wellness programs talk much of reduced insurance costs, fewer employee sick days, and so on. But what is the real payoff? What’s the ROI when it comes down to the simple numbers? The Harvard Business Review reports that since 1995 Johnson & Johnson employees who smoke has dropped by nearly 2/3, and that those who have high blood pressure or are physically inactive has also declined by almost half. Not bad results! 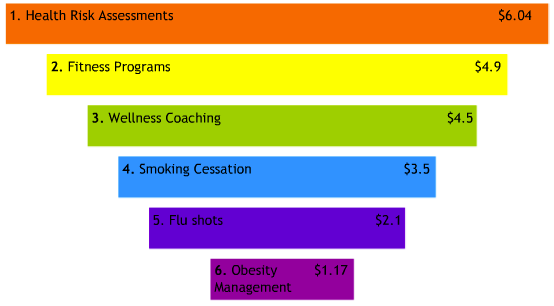 More importantly, Johnson & Johnson estimates that their employee wellness programs have saved the company over $250 million on health care costs in the past 10 years, and that from 2002-2008 the return on every $1 spent on employee wellness was $2.71. But that’s just anecdotal evidence for one company. How about the industry as a whole? The Centers For Disease Control claims that more than 75% of employers’ health care costs and productivity losses are related to employee lifestyle choices. Those are decisions and actions that could be influenced for the better by a comprehensive employee wellness program that rewards positive lifestyle choices. And the cost of a wellness program like that? The Wellness Council of America states in Forbes Magazine that every $1 invested in wellness programs saves $3 in health care costs for corporations. It should be noted that the best returns occur when health related activities are done in conjunction with buy-in from the executive team, are supported with incentives for the employees, and are promoted regularly through corporate newsletters and announcements. The report goes on to quote a 2008 policy paper from the Partnership For Prevention which analyzed the ROI of the most comprehensive corporate wellness programs over a three year period. In this case, even when companies invested heavily in providing the best-of-the-best programs, research found that corporations saved $1.40 – $4.70 for every $1 invested. Anecdotally a corporate wellness program sounds great – improve the health of the workforce, cut down on sick days, and raise morale in the company. But research shows that it’s worth the investment too! At the end of the day, wellness programs and health fairs cut down on direct health care expenses and lowers workers compensation claims. It only takes a few simple calculations to extrapolate the effect the implementation of a wellness program could have on your company. As a baseline the Wellness Council for America suggests setting aside $150 per employee per year for preventative wellness related programs. And according to the research above, you can expect an average return of $3.05 for every dollar invested. If you have a company of 5,000 employees, a wellness program might cost you $750,000 annually, but you’d experience a return of $2.287 million. Over the course of five years that’s over $11 million in direct savings on healthcare costs! Those are quantifiable numbers you can take to your executive team in support of an employee wellness program that will positively effect the bottom line. Last week we launched our Wellness Rewards Program, the new comprehensive corporate wellness program from Abenity. Unlike most corporate wellness programs that do require a per employee fee, Abenity Wellness Rewards only costs a flat monthly fee and incorporates many of the core programs outlined above that will result in positive ROI such as Health Risk Assessments and Wellness Coaching. To learn more about Abenity Wellness Rewards take a look at this in-depth overview of the latest, and most affordable, employee wellness program available.